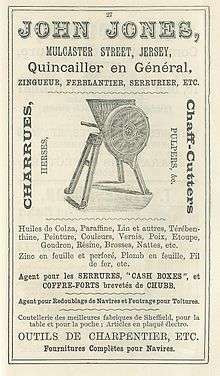 Advertisement for a chaff cutter from the Almanac of La Nouvelle Chronique de Jersey, 1892 from the island of Jersey. Chaff and hay played a vital role in most agricultural production as it was used for feeding horses. 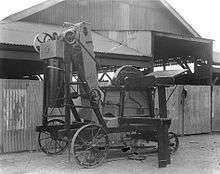 Horses were extensively used in farming operations until they were replaced by tractors in the 1940s. Chaff cutters have evolved from the basic machines into commercial standard machines that can be driven at various speeds and can achieved various lengths of cuts of chaff with respect to animal preference type. New chaff cutter machines include portable tractor driven chaff cutter - where chaff cutter can be in the field and load trolleys (if required). This article is issued from Wikipedia - version of the 3/8/2013. The text is available under the Creative Commons Attribution/Share Alike but additional terms may apply for the media files.